Kin Tsuchi (キン・ツチ, Kin Tsuchi) was a genin-level kunoichi from Otogakure. 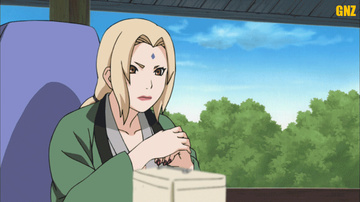 She took part in the Chūnin Exams under orders from Orochimaru to kill Sasuke Uchiha. She was the only one of her team to not have a physical alteration. Kin had very long black hair, almost reaching down to the ground, tied by a violet ribbon right near the end, and black eyes. She wore a forehead protector, a pale green vest somehow similar to a flak jacket, and snake patterned pants and scarf, much like her team-mates.